A Perfect Measure sample of the fourth bottling in Tomatin's limited edition Five Virtues series. 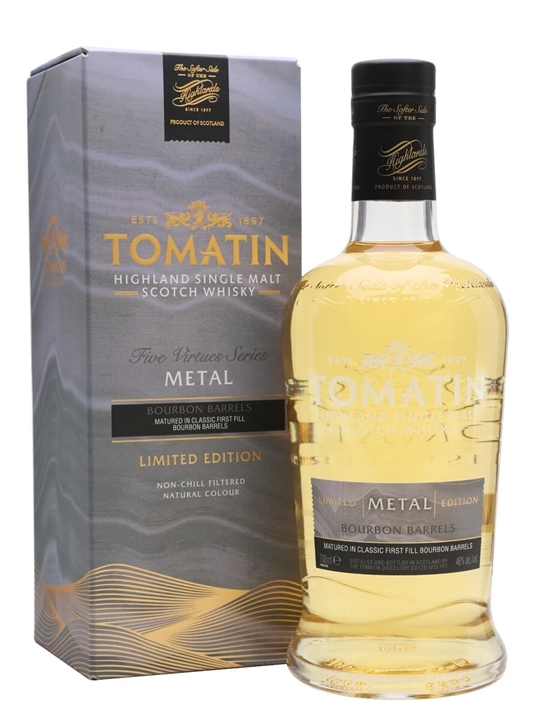 Metal, which pays homage to Tomatin's 12 copper stills, is a sweet, soft and creamy single malt that has been entirely aged in first-fill ex-bourbon barrels. Notes include milk chocolate, marshmallows, citrus, ice-cream and sweet spices. Nose: Vanilla, banana milkshake, Farley's rusks, custard creams, kiwi, apple and mellow citrus. The bourbon influence is immediate obvious. Palate: Soft, with the banana, vanilla, citrus and apple notes joined by white chocolate, peach and hints of spice. Water emphasises oak and cereal notes. Taste: Citrus notes come to the fore, with sweet spices.